Get the kids’ attention as you use the Play-Doh to fashion some type of animal. It doesn’t have to be a work of art, just something simple. When you’re done make a show of exhibiting your creation. Say: You’re right. This animal is just something I made out of Play-Doh. There’s nothing special about it, and it certainly doesn’t have any special power. Wouldn’t it be silly to think that something I made with my own hands would have power? But that’s exactly what happens in the story we’ll hear today. Say: Today we will continue reading from the book of Exodus. Last week we heard the story of God giving His people the 10 commandments. Say: Moses was up on Mt. Sinai for a very long time, while the Israelites waited down below. After awhile, they began to think Moses was not coming back, so they started to get anxious. If Moses didn’t return, who would lead them out of the desert? How would they get to the Promised Land? So they came up with a plan. Say: It was not only ridiculous, but sinful for the Israelites to worship the image of a calf that Aaron had created. Say: While Moses was still in God’s presence, God knew what the people were doing down below. God told Moses that the people had already forgotten about Him, and He would destroy them because of their sin. Moses knew that he had an important job to do, to speak to God on behalf of the Israelites. Let’s read from God’s Word and find out what Moses said. Say: Instead of destroying all the people, God listened to Moses and decided to save them. Do you remember our main point? Let’s say it together. Say: Moses came down the mountain carrying the two tablets that God had inscribed with the 10 commandments. When Moses saw the Israelites worshiping the golden calf he got so angry that he threw the tablets to the ground, breaking them into many pieces. He couldn’t believe that the people were so quick to forget God even after all God had done for them. Moses then burned up the golden calf with fire, ground it into powder, and poured the powder into the drinking water and made the Israelites drink it! Say: Forgetting God doesn’t always mean creating a golden calf to worship. Sometimes forgetting God means thinking we don’t need Him or that He’s not powerful enough to help us. The Israelites had forgotten God, and their forgetting led them into sin. Say: Moses was a mediator for the Israelites. He stood in God’s presence and spoke to Him for them. He would also listen to God and tell the people what He had said. God listened to Moses, not because Moses was perfect or without sin, but because God had chosen him to be the mediator. Moses loved and cared about his people, but even he couldn’t take away their sin. He could only talk to God and ask God to have mercy on them. Ask: Did you know that we have a mediator today? Say: We don’t need Moses as a mediator because we have Jesus! He is the man in the middle, with God on one side and us on the other. Jesus is the perfect mediator because He is completely sinless, and He is the only One Who can take our sin away. God’s grace is so much bigger than our sin. Even when we do really really bad things, we can never sin so much that Jesus’s sacrifice can’t cover us. 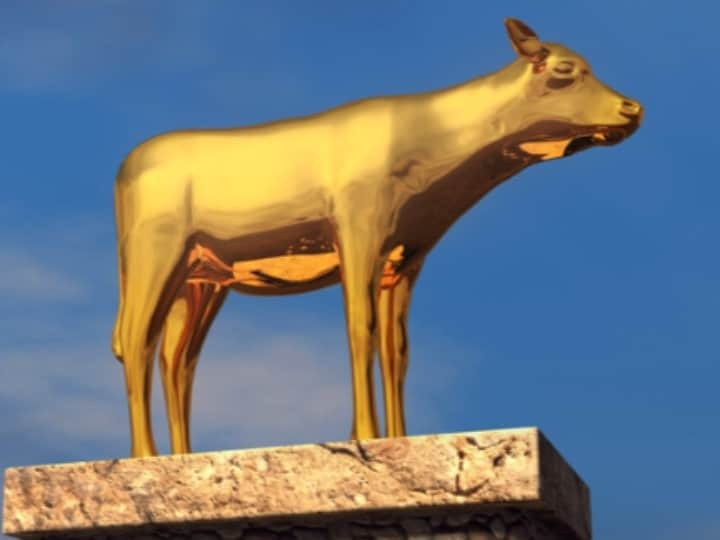 The Israelites did a really really bad thing in worshipping the golden calf, but God still forgave them and loved them as His chosen people. Say: When we declare that Jesus is our King, and we give our lives to Him, He takes away our sin and makes it possible for us to have a real relationship with God! That’s exciting news! We can thank God today for His incredible grace in our lives. We’ll pray and thank God in just a minute for His great grace, but first let’s practice our main point one more time. Pray …. God thank you so much for giving us a perfect mediator in Jesus. We thank you for your great grace in our lives and for providing a way for us to be saved from our sin. Ask the class to see how many of the 10 commandments they can name. Write them on the board (in order) as they think of them. Pass out the construction paper to each child and instruct them to cut out 2 tablet shapes. Encourage the kids to write the 10 commandments on the two tablets. Explain that we’re going to start learning the books of the Bible! Pass out the books of the Bible cards Depending on your class size the kids might have several. Help the kids open their Bibles to the table of contents so they have a reference guide. Clear off some floor space where the kids will lay down their cards. When you say “Go”, start a timer and have the kids race to put their books in the right order. You can do the exercise several times to see if they get faster with each round. Tony Kummer (Editor) reviewed & updated this page on : September 28, 2015 at 11:48 am. All our content is peer reviewed by our readers, simply leave a comment on any post suggest an update.